A neighbourhood-oriented business concept is born in Bloor West Village. 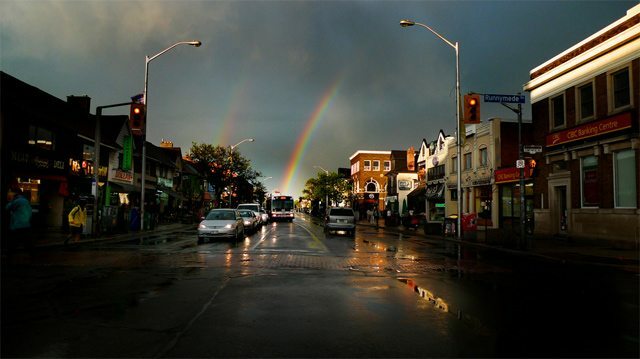 Photo by n+s from the Torontoist Flickr Pool. During the late 1960s, business was dying along Bloor Street west of High Park. People who traditionally shopped along the strip were being enticed away by suburban plazas. The decline of foot traffic accelerated when streetcar service was replaced by the Bloor-Danforth subway line extension from Keele to Islington in 1968. Crumbling sidewalks, worn storefronts with broken signs, and half a dozen gas stations lining the south side of Bloor between Glendonwynne Road and Jane Street pointed to a decaying strip. In the opinions of businessmen like jeweller Neil McLellan, Bloor West needed a makeover. McLellan belonged to the Bloor-Jane-Runnymede Businessmen’s Association, which was having trouble raising enough voluntary contributions to keep it afloat, financially. “We’d spend 95 per cent of our time collecting the money and five per cent blowing up balloons,” McLellan told the Globe and Mail in 1975. The group, along with local lawyers and municipal officials, regularly met over coffee in the back room of the Petit Paris bakery to ponder its financing problems. The solution: collect a mandatory levy from all businesses in the area to fund beautification and promotions. Toronto mayor William Dennison thought the group was crazy when they presented him with a draft bylaw. “The mayor thought we should have our pictures on the front pages of the daily newspapers for getting businesspeople to agree to tax themselves,” McLellan later recalled. 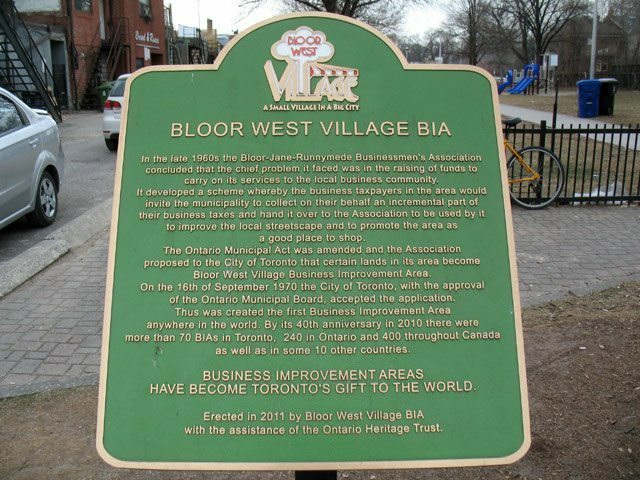 While they didn’t end up earning any page-one glamour shots, the group’s efforts resulted in a 1970 bylaw establishing what is believed to have been the first Business Improvement Area (BIA) in the world. Among its supporters was alderman William Boytchuk, who felt the BIA concept was “a shining example of citizen experts working together to find a solution to a problem.” There was less harmony in Yorkville, where an attempt that year to form another BIA ran up against a spat between two businessmen’s associations. With a budget of just under $50,000, the Bloor West Village BIA quickly improved the local streetscape. Its early efforts attracted businessman Alex Ling. 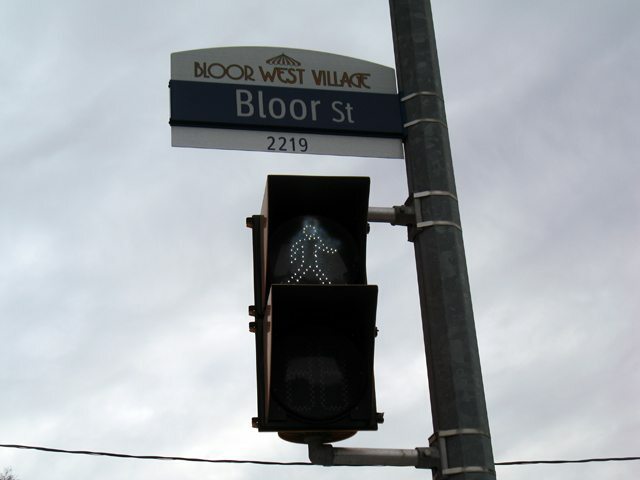 “I drove by Bloor West one evening,” he told the Star in 2010, “and I saw the lights in the trees and the flower boxes and everything. I want to have my store here.” Opened in 1971, Ling’s Importers remains a neighbourhood fixture, with its owner going on to serve as head of the BIA and founding president of the Toronto Association of Business Improvement Areas. The idea spread. The province amended the Municipal Act to allow any municipality to designate areas as BIAs for “the improvement, maintenance and beautification of municipally-owned lands, buildings and structures” and for “the promotion of the area as business or shopping centre.” As of 2012, there were 73 BIAs within Toronto, and others throughout Canada, the US, and other countries. The originators are honoured with a plaque in Neil McLellan Park on Runnymede Road, across the street from one of the subway stations that prompted the concept. Additional material from the May 15, 1975 and August 21, 1976 editions of the Globe and Mail, the December 1986 edition of the Metropolitan Toronto Business Journal, and the October 14, 1970, May 21, 1971, July 28, 1978, August 7, 1984, and April 18, 2010 editions of the Toronto Star. Photos by Jamie Bradburn/Torontoist, unless otherwise indicated.